This is David's Mission President and his wife - President and Sister Cantu. This is David and the guys he traveled to Mexico with. The guy on the right - Elder Morrise - was his companion in the MTC. 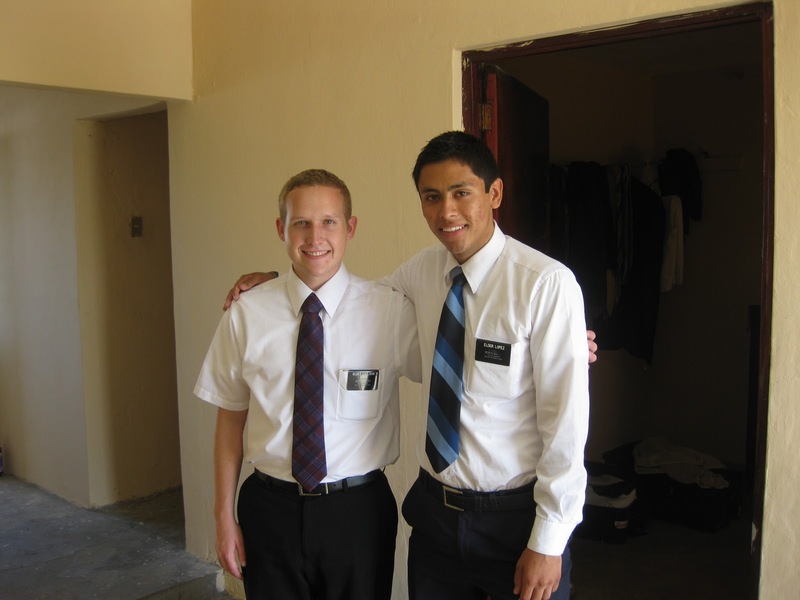 This is Elder Lopez with David. He's a Mexican native. He and David went out and worked together in November 2011. This is David's first Mexico companion. His name is Elder Ward. He's been out 4 months longer than David. Well I´ve survived another week in Mexico. Things have been going a little better with the language. I´m able to understand a lot more of what people are saying now but still having a lot of difficulties with the speaking part. Poco a poco, people say, which is little by little. So I´m adjusting to that still but will be for awhile. Elder Ward said that one of the best things that I can do is just to read in the spanish book of mormon. So I´m going to try and do that more when we have our little personal study time for an hour in the morning. We eat each day with someone from the ward at 2pm and that is our meal for the day. At first when I heard that I was like wow I´m going to be starving, but I´m definitely not. We eat breakfast before we go and have a pretty good size me at 2 every day by someone who signs up to make us food. Then sometimes I eat random food at the apartment at night too.. But things are going good! I´m feeling a little more adjusted to Mexico now. But there are definitely weird things I see everyday that I didn´t realize haha. In the beginning of the week we had divisions. Where I got to switch companionships for the day. I had Elder Lopez for the day who is from Mexico so I got to use my spanish a lot more. E. Ward talks in spanish pretty much all the time but since he can understand english it´s easy for me to get lazy and say things to him in english. So this was defintitely a good experience for the spanish and ended up being a good day for teaching too. We taught some of there investigators in that area of Mazatlan and I helped answer there questions. E. Lopez has been in Mexico longer than me but has less time on the mission than me. So that was kind of funny. We both are definitely learning a lot of stuff still but we did pretty well... Then later in the week we had some good lessons and some strange ones. One of them was with a pastor from a different church. He was very nice at first but then at the end wasn´t intrested at all. The hardest thing in our area right now has just been finding new investigators. 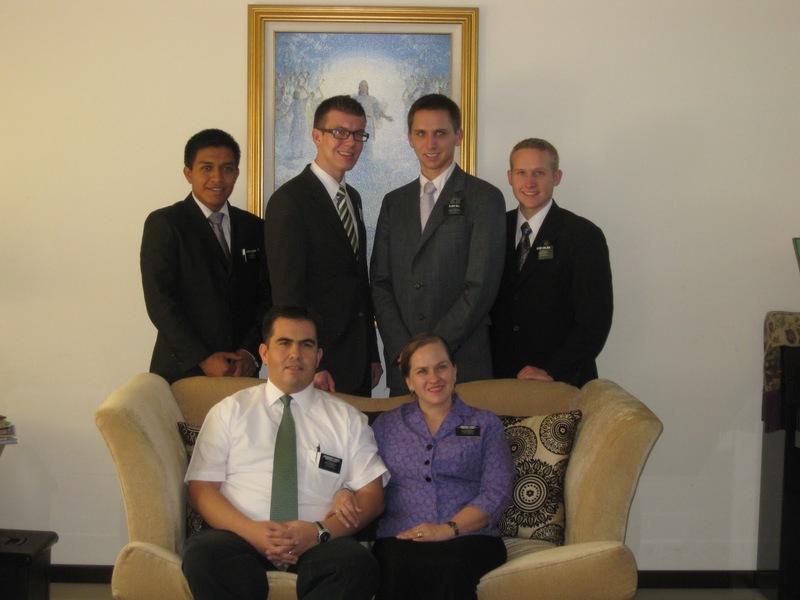 But we did teach someone who had been having the missionaries over before. She already had all the lessons but hadn´t been taught since like June so we decided to stop by and see her. We were just starting back at lesson 1 talking about the restoration of the gospel and spent some time getting to know her. She ended up opening up a lot and told us about how her husband had died several years ago and how that was hard for her. E. Ward asked if she knew that she could see her husband again after this life. And she didn´t know that! So we taught her a little bit about how she will be able to see him again and then asked her if she wanted to pray to know that these things are true and to feel the spirit. So we had a prayer and then were just silent for a little while. I could feel the spirit pretty strongly and then we asked if she could feel it. She said she could and said that she felt really good and at peace. We talked to her a little bit more and then asked her if she wanted to be baptized and she said yes! It was pretty cool to see someone taking that step in the gospel. Besides that we have been working with our other investigators that we have. Two of them want to get baptized but need to get married first. We are waiting on her birth certificate to get sent to her because she needs her original one for the marriage license apparantly. So hopefully it comes soon! They come to Church every week and things have been going good with them. We also have a 9 year old boy we were teaching some of the lessons too. A lot of his family are members and he is going to be baptized this week! So that is great too.. We are trying to find more people to teach. We didn´t do as much tracting this week but got some references of people to visit so we are going to check up on them. I attatched some photos with me and the mission president when we got here. 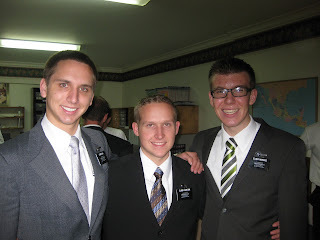 Elder Morrise and Hill, the ones I traveled to Culiacan with. 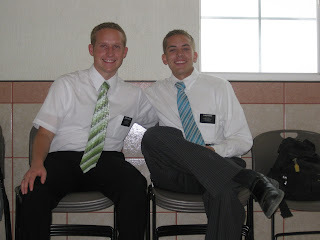 Me and my companion Elder Ward.. Me and Elder Lopez too!.. Things are going good though here and it has cooled down a little bit. It just is a different cool here. Never really gets cold haha, but right now it is pretty bareable. Thanks for all the support, prayers, and letters again!